While a dog’s psychological value to its owner is very much attested, helping cure loneliness and such, a recent study published in the Journal of Physical Activity and Health, finds that people who own and walk a dog are 34 percent more likely to meet federal benchmarks for physical activity. 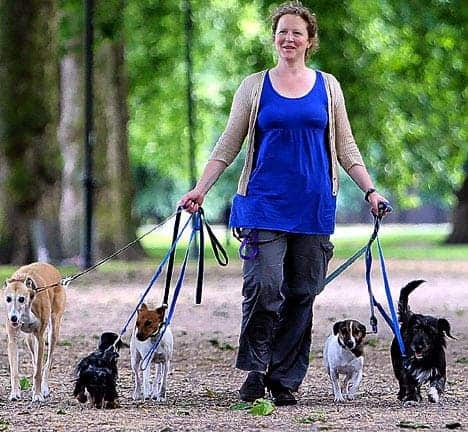 The study states that, obviously enough, people who own and walk a dog reach a higher walking amount as opposed to another that doesn’t own a dog, but what researchers found interesting enough is that dog walkers are physically more active, generally walking about an hour longer per week than people who owned dogs but did not walk them. Walking is deemed the most easy and accessible form of exercise by fitness specialists, and you’d be imagined how much good 20 minutes worth walks a day can do for the mind, body and spirit. The study analyzed the amount of leisure-time physical activity a person gets, including sports participation, exercise conditioning, and recreational activities such as walking, dancing, and gardening. According to Public health benchmarks 150 minutes of such activities are warranted each each. Well it seems that owning and walking a dog (if you’re one of those people who just let their pupps in the yard all day long, shame on you) is really recommended, so if you can afford the responsibility of getting a dog, you shouldn’t think too long about the decision.